The DFRobot Xbee USB adapter is used for the XBee module configuration parameters to facilitate or to use as a wireless data transmission. It can be easily connected to a PC via mini USB cable. Further, it has XBee-setting support software X-CTU. It can also be used as a USB-TTL adapter. 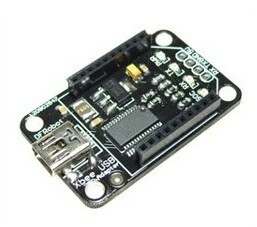 Get Xbee USB adapter (SKU: DFR0050) from DFRobot Store or DFRobot Distributor.